This coming Wednesday, April 22, the world celebrates Earth Day. Starting this weekend, communities around the globe will unite for the common cause of making our world more inhabitable, volunteering and sharing information to help everyone become just a little more environmentally conscious. Now 45 years since the first Earth Day, it’s easy to forget the roots of the celebration. While Earth Day today is often a grassroots, community affair, the day first came about as a national (and shortly thereafter, international) political movement. When he founded Earth Day in 1970, U.S. Senator Gaylord Nelson sought not to simply inspire local clean up, but to create what he called “a national teach-in on the environment” that would garner enough attention to sway the thinking of those in the media, business, and political worlds. Earth Day has always been about information and demonstration — presenting to the citizens of the world the importance of each and every aspect of our Earth and our environment, and taking any stage possible to make the case for changes large and small to be made in order to protect the only home we’ve ever known. Today Earth Day is the largest civic event in the world, celebrated simultaneously around the globe by people of all backgrounds, faiths and nationalities. More than a billion people participate in Earth Day campaigns every year. They do so because the events really work — the annual observance has been credited with helping to create everything from Clean Air and Endangered Species Acts to the U.S. Environmental Protection Agency and even paving the way for the 1992 United Nations Earth Summit in Rio de Janeiro. In this edition of the Week In Ideas, we’re celebrating Earth Day early — because as with so many things in our environment, it’s better to recognize good ideas before it’s too late. What can you do to help celebrate Earth Day? Volunteer! Plant a tree or a garden. Make the switch to higher efficiency lighting and electronics. And if you can, organize an event in your community, and share with as many people as you can why we all need to do everything we can to protect our environment on Earth Day — and every day. 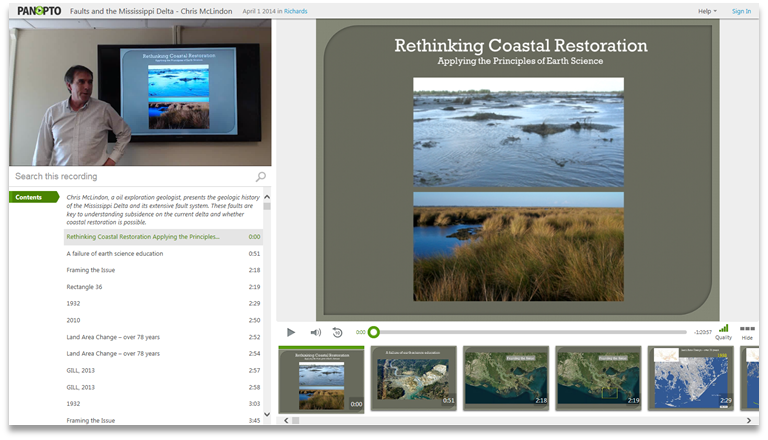 This week we’re passing on some of our favorite environmental and ecological presentations, statements, and messages shared with Panopto’s video presentation software. We hope you enjoy, and more importantly, we hope these inspire us all to do our part to protect our planet. The data on global climate change continues to accumulate, becoming more striking with each new study. 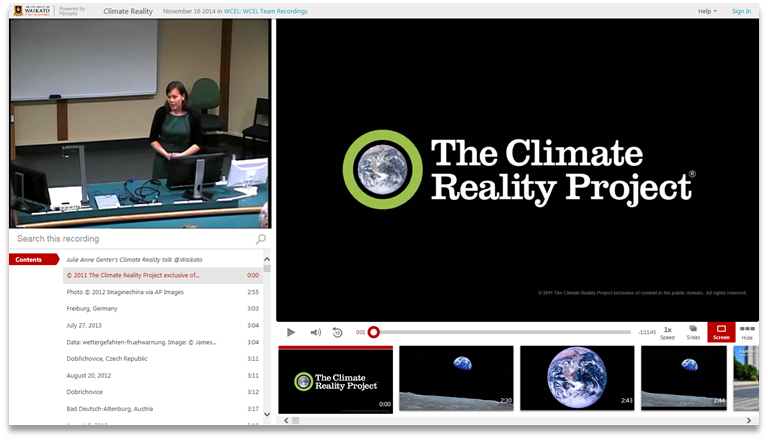 The Climate Reality Project presentations educate people about climate change, and build local networks of climate activists who work in their own communities and countries demanding solutions. Join Julie Anne Genter as she shares her learnings with Waikato University in New Zealand about the global climate crisis and its solutions. 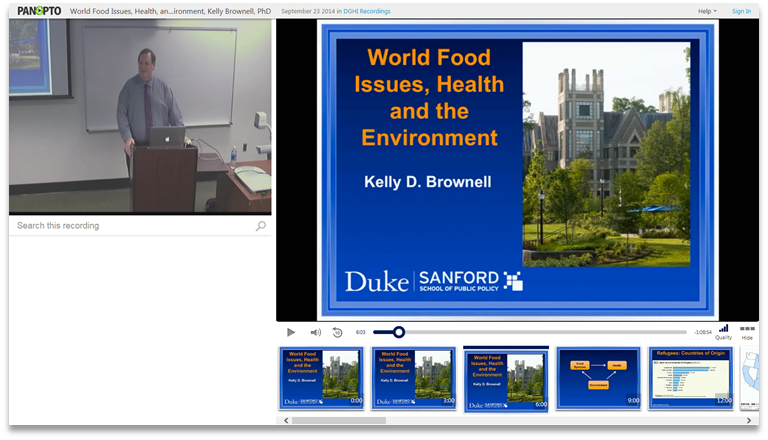 Join Kelly Brownell, Dean of Duke University’s Sanford School of Public Policy, for this discussion on how the factors of food insecurity, obesity, agriculture, and food safety influence each other, and how they impact food policy. 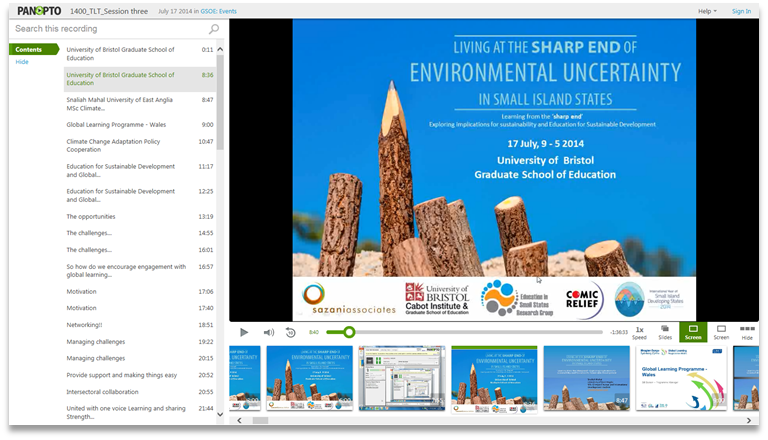 This recorded conference keynote comes from the University of Bristol, and explores the implications for sustainability and education for sustainable development in small island states. With contributions from Caribbean, Pacific and Indian Ocean small island states, this conference delves into the issues of environmental instability that threaten the very being of many nations around the world. 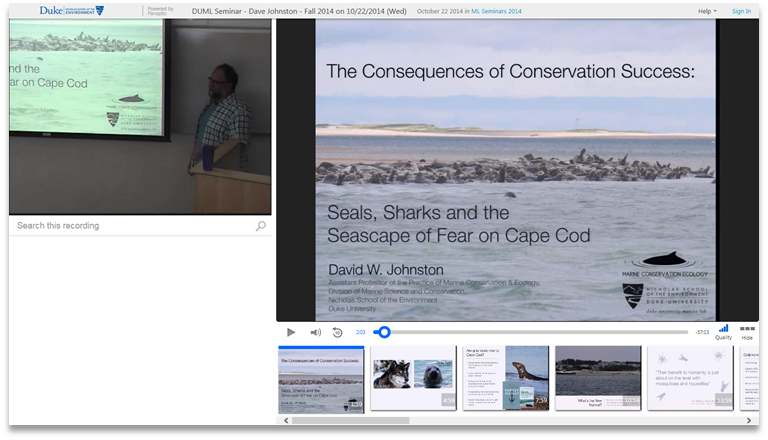 Join Dr. David Johnston of the Duke University Marine Lab for this recorded live webcast of the university’s fall seminar on what happens when conservation efforts begin to succeed. Dr Johnson takes the northeast coast of the United States as his case study, and looks into the effects that the reemergence of the gray seal has had on the local environment. Chris McLindon, a oil exploration geologist, presents the geologic history of the Mississippi Delta and its extensive fault system. These faults are key to understanding subsidence on the current delta and whether coastal restoration is possible. The effects of climate change will have far reaching consequences for water resources across all dimensions of water security, particularly through changing frequency and intensity of extreme weather events such as floods and droughts. 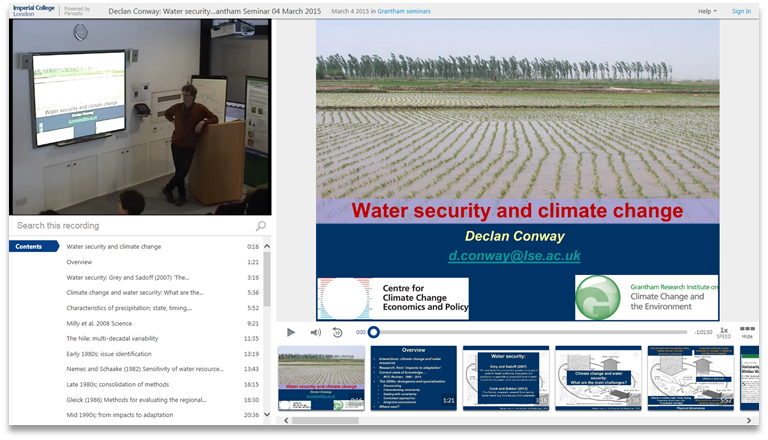 Join the Grantham Research Institute on Climate Change and the Environment for this recorded presentation from Declan Conway of the London School of Economics, summarizing the interactions between anthropogenic climate change and water security and reviews developments in research on climate change and water resources during the last three decades, tracing a shift of focus from climate impacts to broader management and policy concerns addressing the need for adaptation. Fish + Oil + Heat: A Recipe for Ecosystem Shifts in the Gulf of Mexico? 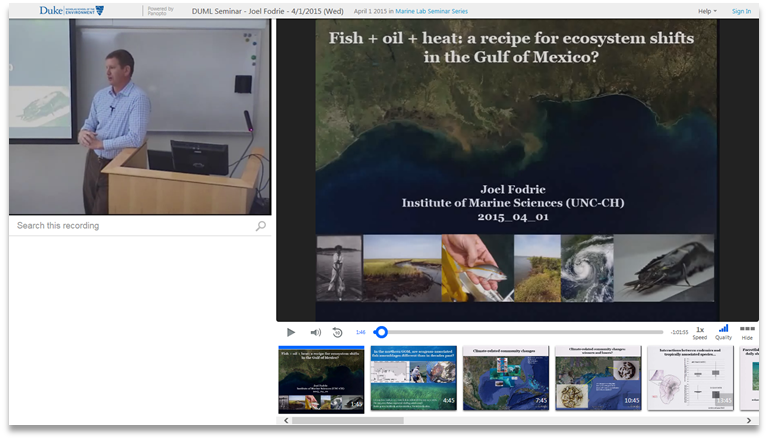 Sit in on the Duke University Marine Lab seminar, featuring Dr. Joel Fodrie from the University of North Carolina’s Institute of Marine Science. Fodrie explores how fish are responding to climate change, long-term fisheries, and the Deepwater Horizon oil spill, and how the cumulative effect of those responses may represent a notable ecosystem shift overall in the Gulf of Mexico. 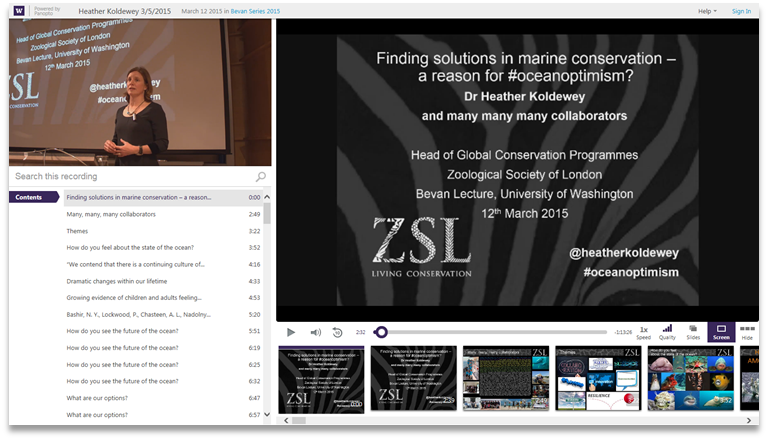 Finding Solutions in Marine Conservation — A Reason for Ocean Optimism? If marine conservation is truly important then why is it at the bottom of the political agenda? Is the conservation community failing in selling the conservation message to the general public? A growing body of research that indicates that many people — especially children — feel anxious or hopeless about the state of the planet and their ability to effect positive change. Unfortunately, environmental narratives — both mainstream media and scientific — are focused on “doom and gloom” stories, which frighten, disempower and disengage people. Mistakenly, the conservation community often buys into this approach, in the belief that more information about how bad things are will spur people to action. In this guest lecture, Dr Heather Koldewey explores how we might adopt different, positive and hopeful ways to engage people in marine conservation, leading to changes in behaviour and a more sustainable relationship with the ocean. 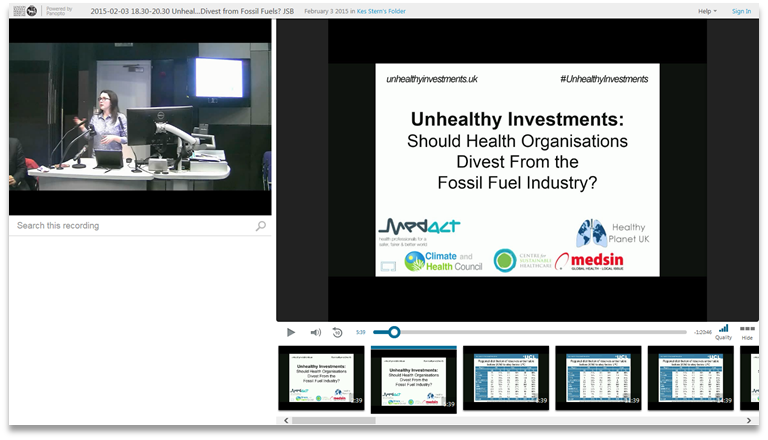 Unhealthy Investments: Should Health Organizations Divest from the Fossil Fuel Industry? Join the audience at the London School of Hygiene and Tropical Medicine for this recorded live event, taking place to mark the public release of a report about the case for divestment from fossil fuels by the UK health community. An expert panel examines this complex issue from several perspectives, including public health, climate science, healthcare sustainability, finance and socially responsible investment, providing viewers with a more clear insight into the arguments both for and against health organisations continuing to invest in fossil fuel companies. 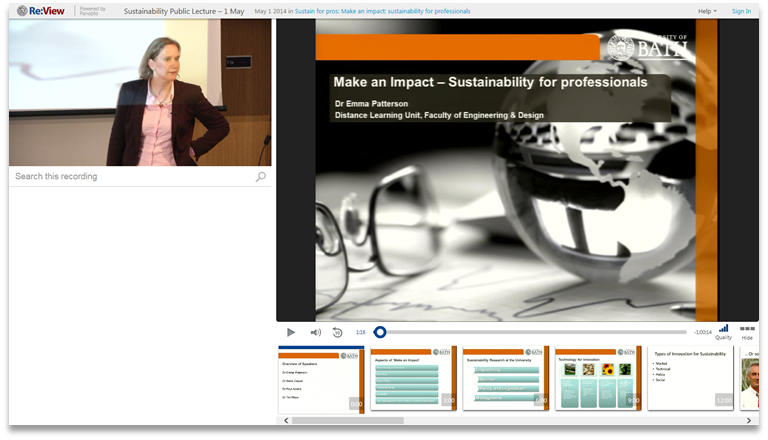 Dr. Emma Patterson and her colleagues from Bath University share this recorded lecture given as part of the university’s MOOC course on sustainability, challenging learners to create a sustainability strategy both for themselves as well as their organizations. Panopto makes it easy for anyone, anywhere to record presentations and share them online, both as live streaming webcasts and recorded on-demand video. To see how Panopto can help you share your ideas, contact our team for a free trial today.